Not surprisingly, the Great Wall of China is the eigth wonder of the world. With approximately 6700 km of length it becomes the longest protective fortress to the ground and generally is one of the greatest construction and architectural achievements of mankind. This achievement of the Chinese empire extends from west to east: from Liaoning Province through Hebei province, municipality of Tyandzhin Beijing, the autonomous region of Inner Mongolia, Shanxi province, Autonomous Region Ningxia and up to Gansu Province within the Republic. The wall curves and crosses mountains, plateaus and deserts. The Great Wall of China is not continuous, and consists of several later walls. The construction of the Great Wall of China began about 7th century BC in the Qin dynasty and still continued going through the management of several dynasties rulers. The initial idea was to raise the wall as a protective device against barbarian invasions from the north. In itself it is a miracle of ancient Chinese works. Its thickness in places reaches 8 to 10 m and heights up to 15 m.
The main materials for construction were, earth, stone, tiles and wood, sand, and the needs for the advancement of its locations in the mountains were built of stone quarries, where they procured rocks directly. The upper wall is lined with 3-4 layers of bricks that are so well bonded with lime, it is impossible they should sprout grass. Giant towers were built in which a guard could stand 30 to 50 troops. As it could hold six lines horsemen each had located 180 meters of staircases and sewers to swell the water. 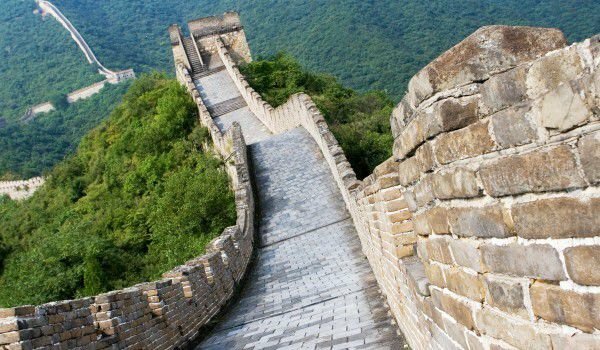 A huge resource of people were needed to build the Great Wall during all these centuries. Around 500, 000 people were killed for the first 10 days of its construction in the 7th century. There are many places where the Great Wall of China can be visited. Around Beijing the closest are Badaling and Juyongguan, which are the most popular and lively plots. Mutianyu is also near the capital, but a little more crowded than the above two points. There has even been a gondola built, which gets visitors to the wall. Alternative to this the lift ladders are built. Huanghuacheng is one of the most well built sections of the Great Wall of China and is located 60 km north of Beijing. This is called the stronghold of the yellow flower and this area is rarely visited. The he 20th century saw the beginnings of the restoration of the Great Wall of China, and in 1987 was declared World Cultural Heritage. It is the only object visible from space with the naked eye.